AceIQ | Part 1. 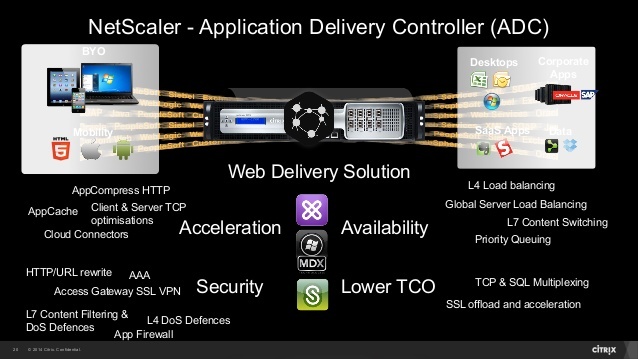 Citrix NetScaler – The Only ADC You Need! Part 1. Citrix NetScaler – The Only ADC You Need! A question many of you might not easily answer. “It’s a load balancer!” some might say. Although not an incorrect assumption, but there is also so much more to it. The acronym stands for Application Delivery Controller and is a network appliance built for enhancing performance, security and availability for applications and services accessed over the web. Most people today carry around several types of devices ranging from smartphones, tablets to laptops. These devices can be supplied by your company or they might be your own (BYOD). An increasing majority expect to be able to use any of these devices to access company applications, email and sensitive documents. On top of that it’s expected to always be functional, available and with a good user experience. Sounds easy enough right? This is where our ADC – The Citrix NetScaler – comes into play and which we at AceIQ are working diligently with. With the help of the Citrix NetScaler we can adapt your applications to function and perform optimally no matter what type of network or protocol is in place and across all types of devices. We can also offer maximum availability with a high grade of security partly thanks to strong encryption. The Citrix NetScaler can be compared to a Swiss army knife when it comes to all of its functions and features. With some creativity and innovativeness there’s no end to what you can achieve with this wondrous appliance. It’s capable of many things and it does it very well! The conclusion can only come down to this – With a Citrix NetScaler in place you will have every opportunity to succeed in a more efficient operation! Please continue reading our blog and we will tell you all that you need to know about the Citrix NetScaler and why you should invest in this product. Also read up on Hayder Alis blog post if you haven’t already and you will find out more about the Citrix NetScaler and how it can help protect your company against cyber attacks. Contact us at AceIQ today and we will help you to customise the perfect solution for you! Are your NetScaler infrastructure up to date? Subscribe to our news by signing up with your email below.